Reasons why your utility status says your "meter not current"
There are a few reasons why your utility enrollment status says that your "meter not current." If this is what you see on your utility details on your settings page, you're in the right place! Let's go these possible scenarios that lead to your meter status not being current and what you can do to fix this issue. 1. You have signed up with another account in our system with the same utility credentials. Not to worry! Read more about duplicate accounts here. 2. We have stopped receiving your interval data. This can happen when you move and haven't updated your OhmConnect account. Please go to your settings page and click "I moved" under "Utility Details" to change your account information. Please note that updating your account information is a similar process when you first connected your utility - you have to go through the enrollment process again and it can take a 5-7 days. Not to worry! We will credit you with 2 weeks of #OhmHours once you're connected again. If you haven't move, please contact your utility company to make sure that your smart meter is working properly. 3. It is possible that your authorization wasn't submitted correctly and your enrollment is stuck. 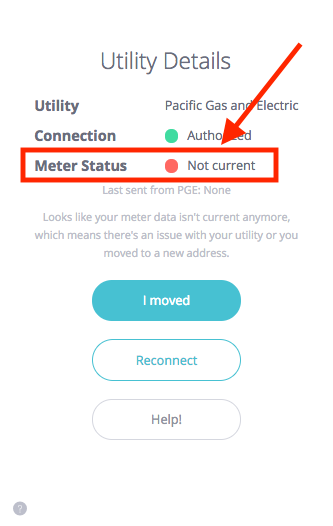 If it has been over a week and you see that your utility information still says "meter not current," you will need to re-authorize OhmConnect through your utility. Here are FAQs on how to do so: PG&E, SCE, and SDG&E.